Hello everyone! I’m so happy to be here today guest posting for Nicole. My name is Joanne and I blog over at Wine Lady Cooks. I’m a wife, mother, and grandmother and I share family friendly recipes that are most often quick and easy to prepare. I’ve been blogging since 2009 and didn’t know how my blog would evolve until I realized my favorite food category is dessert while at the same time our family’s dietary needs were changing. The last two years I have been adding recipes that are healthy ‘alternatives’ to some of our favorite foods. Some are winners and some the family is just taking longer to adapt into their menu but I keep on trying. Today I’m sharing watermelon popsicles which are easy to make and it’s a healthy treat that everyone will enjoy. I’ve been making frozen treats for my grandsons since last year and this year we’ve been creating new fruit combinations together. It’s a great way to have the kids help out in the kitchen and they are more likely to try new foods when they see how everything comes together. Watermelon screams summer and it’s a fruit we may not realize has many health benefits – who knew? – well some know but some of us may not have even thought about it. Watermelon chock full of nutrients and minerals and it’s 92% water which means it is very hydrating during the heat of the summer. Great for the kids when they are running around and need to stay hydrated. Frozen fruit treats are very easy to prepare. If the fruit is sweet then the added bonus is a sugar free snack – definitely a plus. When the summer temps are rising it’s a cold and refreshing treat for both kids and adults. Place the watermelon into blender with the lemon juice and a 1/2 cup filtered water and blend until the fruit is fully pureed - approximately 20-60 seconds - depending on the type of blender used. Taste the watermelon 'juice' for sweetness. You can add honey or your preferred sugar according to taste if necessary. If you choose to strain the juice, pour the pureed juice through a strainer and/or the coffee filter into a bowl (if your blender purees the fruit with no pulp left you can skip this step). Pour into the pop molds and freeze 4-6 hours. Freeze time depends on your freezer. It was a pleasure sharing this recipe with you. Enjoy the rest of your summer with a refreshing frozen fruit treat. Yum! Love watermelon so much and those popsicles look so refreshing. I never liked watermelon growing up, but I’ve really developed a taste for it, especially on a hot day! Hi Nicole and Joanne – These look delicious! What a good idea. They look delicious. 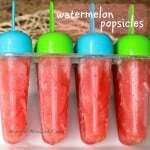 I find myself craving watermelon in the summer…I think I would enjoy these just as much as the kids! These look delicious! Thanks for sharing! And my favorite food category is definitely desserts also. It’s funny- I was looking at my “Food” board on Pinterest and realized I should just name it “Sweets”. There’s like 2 dinner recipes and 200 desserts, LoL! How simple and scrumptious! I’ll have to give this a shot when the temps decide to get warm again. Thanks for this! !